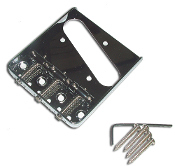 Modern Tele Bridge: Standard Tele Bridge. Your choice of colors. 6 saddle design. Steel baseplate. 10.8mm string spacing fits most U.S. and Mexican Fenders. Comes with mounting screws and allen wrench. Thru body stringing.